Human Spirit vs Natural Disaster? As I sit and write, our mountain burns. It burns a blaze that has been going for over 48 hours. It has been fanned by winds over 60km’s an hour while brave men and women simultaneously beat the flames, pitting the strength of nature against the strength of human spirit and tenacity. We don’t yet have a winner. The fire continues to burn at an astonishing rate, leaving the area of devastation at around 3000ha and counting, almost all of which is protected National Park. Five houses, one of Cape Town’s most prestigious hotels and now Tokai forest, burn. As someone living in the heat of the devastation I have been overcome by the community around me. Not always a group that supports each other, Hout Bay is often chastised for its stark contrast in class and living conditions. There is community violence, xenophobia and theft. People don’t always put their best foot forward. Yet throw something as terrifying as a fire into the mix and you have the ‘Hout Bay hustle’, the uniting of the people. Something I am proud to bare witness to.There was a plea put out this morning to help the fire fighters with food and water. A simple plea, it didn’t ask for much. In amidst my morning I thought, I wonder how many people will read this and assume everyone else will do it? How often do we all sit back and assume someone else will step forward? I venture to say most of us, all of the time. So I pulled myself away from my desk, got in my car and headed down to Hout Bay Neighbourhood Watch headquarters, to see how I could assist.I was blown away, not by the blustery wind as thankfully that had stopped, but by what I found there. A lovely old man was standing by, guiding people to deposit their contributions in trolleys already laden with goods; bottles of water, energy drinks and crates of fruit. Fresh croissants, homemade sandwiches and cartons of eye drops for the poor fire fighters smoke filled eyes. He told me they had already moved 20 trolley loads of groceries to where it was needed on the mountain, and it was only just midday. I was overcome with gratitude. 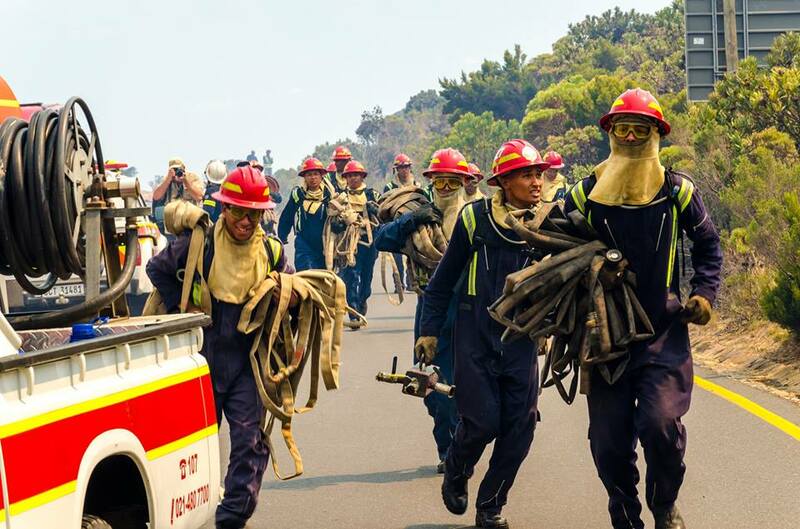 Gratitude for my fellow countrymen who jump when they are needed and pledge what they can to help in the immense task of saving their land and their homes, of helping the brave fire fighting men and women in a task that can only be described as painfully hot and back breaking work. More people than I could ever have hoped for answered a cry for help, it sparked a love for my community and my countrymen such that I haven’t experienced in quite some time. I know it wasn’t only me that felt this outpouring of love today. I heard it spoken of in the shops, saw it on countless social media posts and saw evidence of the appreciation at Neighbourhood Watch Headquarters. Hout Bay I salute you, as I salute the brave men and woman fighting on the mountain tonight. The fire might have wrecked devastation, but it cannot beat down the human spirit.